Welcome to another Featured Event! This event is about two of the most beautiful things about our world: Love and Difference. Love bridging and celebrating those Differences… and the Love of doing things Differently in general. Our bride and groom this week wanted to have a cupcake display that was unique and reflected the coming together of two cultures. 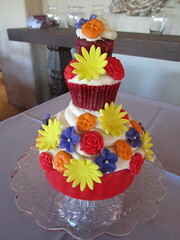 For the groom, an American classic – Red Velvet. If you didn’t know, Red Velvet was invented in the American south in the late 1800′s as a combination of Red Devil’s Food and Chocolate Velvet cake recipes. This flavor has gained a lot of popularity in the past few years and seems ubiquitous in American bakeries, but it’s still not very common outside the US. 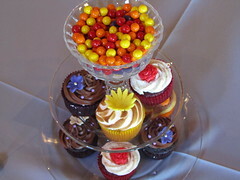 For the bride, a British treat – a cupcake based on Terry’s Chocolate Orange. We took an actual Terry’s, melted it, and incorporated it into a chocolate buttercream. Delicious! 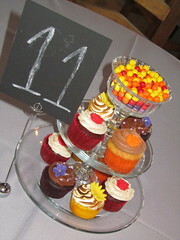 Those, along with two other flavors, were uniquely displayed on individual cake stands. 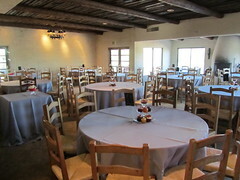 Talk about bringing people together – each table ended up discussing which flavors they wanted. We even heard stories after that one guest went from table to table, collecting “spare” Red Velvet. Hahaha! For the bride and groom, we did a towering tiered cupcake with a little bit of everything. We loved working with this couple – the ideas and flavors were fun, interesting… and unique to them. It’s so cool to put together something that reflects the people getting married, even down to where they were born. Bringing two families together, when they’re separated by culture and an entire ocean, is a seriously beautiful thing and we’re so lucky to have been a small part of that.